The first photographic evidence from the corruption trial of Sen. Robert Menendez released Wednesday shows the private jets that the senator flew on with Florida eye doctor Salomon Melgen. The photos were belatedly ordered released by Judge William Walls after news organizations complained to the court about its attempts to keep evidence shown to the jury out of public view. 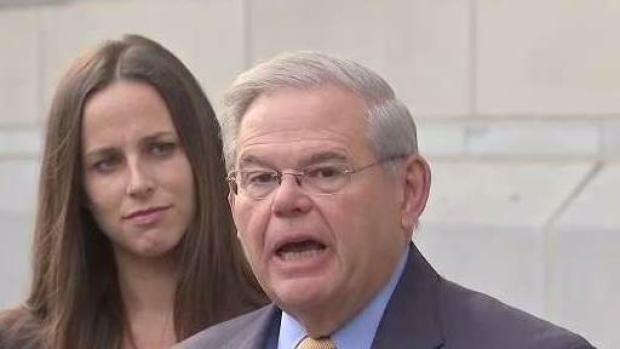 Prosecutors have told jurors that the Democratic New Jersey senator took more than a dozen flights, but did not report such gifts as required and only later reimbursed the eye doctor for three of the flights. 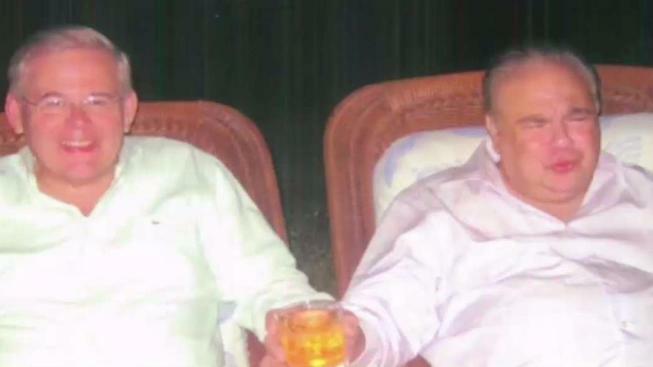 Prosecutors said the private jet trips and luxury vacations were part of the bribe scheme. Menendez allegedly used his office to help the doctor – later convicted of a separate massive Medicare fraud scheme – win business deals and fight Medicare fines. Menendez insists the doctor is a longtime friend and that the gifts and trips were between friends, and that he always acted legally when taking official action as a senator. Photos show the Challenger 600 jet along with its luxurious interior. Photos of the bar area were also included. Pilot Robert Nylund testified he flew Menendez 16 times and was told to keep the bar stocked with the senator’s favorite water and juices. The court has not yet released photos of Melgen’s overseas girlfriends that were shown to the jury. Menendez tried to help the women get visas to come to the U.S.
Menendez said there is nothing improper about a New Jersey senator helping a Florida doctor with his personal or business needs. In a filing Wednesday, lawyers for Menendez pointed out the senator gave help to lots of people and defended interests of people who are not residents of New Jersey. "In particular, Senator Menendez’s attention to cultural minorities and under-represented communities, particularly Hispanic-Americans, as well as immigration issues generally, exemplifies his focus on ethnic constituencies whose members are not limited to New Jersey residents,” his lawyers wrote to Judge Walls. The court is deciding whether the term “constituent” should be defined for the jury and whether geographic location plays any role in that assessment. Also during trial Wednesday, prosecutors also showed jurors a clip of a CNN interview Menendez gave in early 2013 and a news release put out by Menendez's office. In both, Menendez acknowledged he took a few flights on the plane of Florida eye doctor Salomon Melgen. In the CNN interview from February 2013, Menendez discusses his reimbursement of about $58,000 to Melgen for some of the flights he took a few years earlier. The delay in reimbursement was because the flights "unfortunately fell through the cracks" during a time when he was busy with travel on behalf of Senate Democrats and for his own campaign, he told CNN. Pressed on whether he paid back the money only after reporters began inquiring about the flights, he replied, "That's not the case. The bottom line is when it came to my attention, I paid for it." The relationship between Menendez and Melgen surfaced in early 2013 after FBI agents searched Melgen's West Palm Beach offices. Melgen ultimately was charged and convicted of Medicare fraud in a separate case not involving Menendez. FBI agent Alan Mohl, who worked on the Menendez investigation from 2013, testified Wednesday that Menendez's Senate disclosure forms from 2007 through 2011 didn't report flights he took on Melgen's plane between New Jersey and the Dominican Republic, where Melgen owns a villa. Mohl also testified that Menendez didn't report a stay at a $1,500-per-night Paris hotel in 2010 paid for with Melgen's American Express points.